LoveNotes for Lovers is a collection of meditations, affirmations and reflections on love. A valued relationship is something you work on all the time, not only when its broken and needs to be fixed. LoveNotes for Lovers assists in that process. Every LoveNote is but one more piece of the relationship puzzle. The design of LoveNotes for Lovers is to help people fit the pieces of the relationship puzzle together in a healthy way. Each one is a mini-lesson in love. 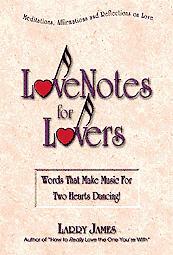 LoveNotes for Lovers is short, snappy, and easy to read. Open it to any page, and great advice jumps out! You'll refer to it over and over again! LoveNotes for Lovers is a book for together lovers. . . husbands, wives and committed lovers; those who have found their true love. . . for love partners whose love has grown cold; those who would like to recapture the excitement that brought them together in the beginning. . . for lovers in waiting; those who are alone, no longer lonely and ready for a committed relationship. LoveNote. . . Intimate lovers don't have to say words to be understood. Often a knowing glance or touch can say all that needs to be said to ignite passion worthy of pursuit. From the book "Love Notes for Lovers: Words That Make Music for Two Hearts Dancing." Want to read some of the book before you buy it? Many of the articles listed in the "Relationship Articles Menu" feature topics from this book. Click here. "LoveNotes for Lovers" was listed as #4 on the "TOP 5 Non-Fiction Romance" books on Addicted-to-Romance.com on June 2, 2000. Larry's other books, "Red Hot LoveNotes for Lovers" and "How to Really Love the One You're With" were listed as #2 and #3.